Bright light flickered through the trees as we sped through the busy city of Denpasar towards the northern jungle town of Ubud. Motorcycles with 1, 2 and sometimes 3 happy family members aboard buzzed around us weaving through traffic. In each village we passed through, I saw workshops of stone or wood sculptors and streetside huts steaming with meat on a grill. Every home had been blessed, stairs decorated with marigolds or frangipani peeking over the walls of their compound. A warm floral air filled the car and I really smiled. I was some place new. My best friend and I have been through a lot in the last couple years; she lost a beloved grandmother and me, my closest creative confidant, my father. We needed to get away, far away from home. 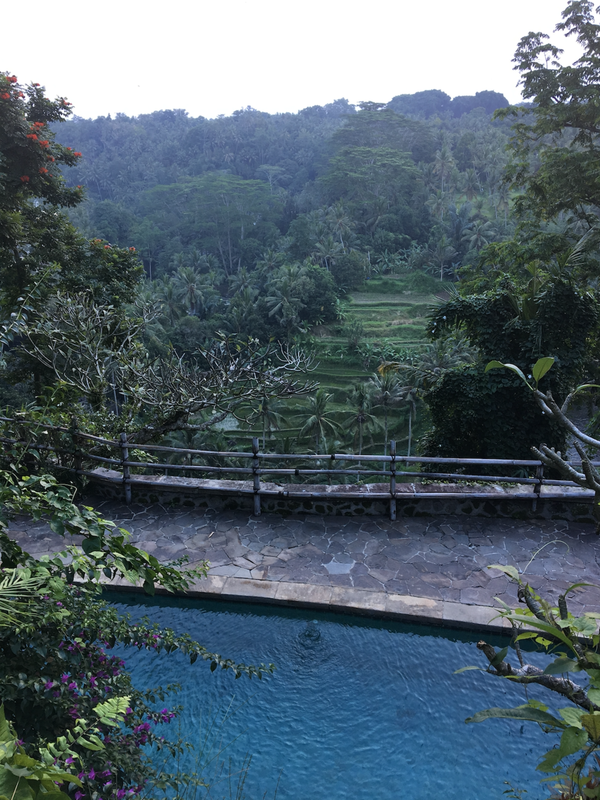 We decided in Bali we could find new landscapes, beauty, tranquility and calm. And from what I could tell so far, this was definitely, the place. 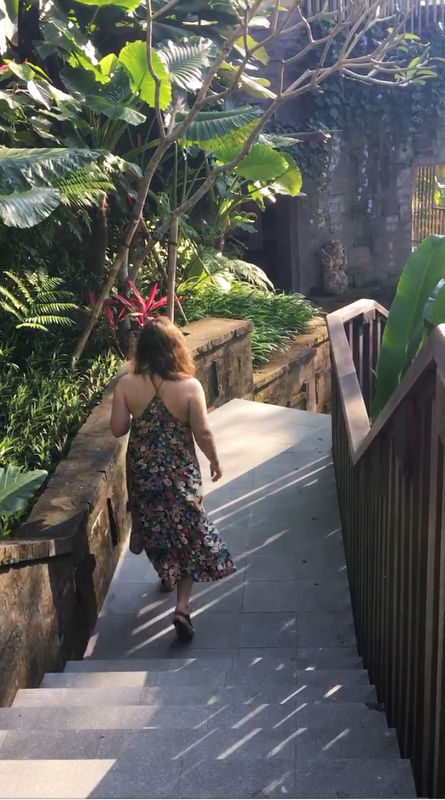 In the early 1930's, Canadian composer Colin Mcphee built a home, Taman Bebek, in the hillside village of Sayan, Bali while his wife was studying the cultural anthropology of the island. The property overlooks a deep ravine which reveals a rushing stream below. Across the valley, there is an epic view of terraced rice fields and the mountains of Tabanan. Current residents of the Presidential Suite annex, the lovely Rita (a former model and current accessories designer) and Gregorio, were gracious Airbnb hosts. Our first night, we treated ourselves to a delicious dinner at The Sayan House, just 2 minutes up the road and fell into bed before 10pm. 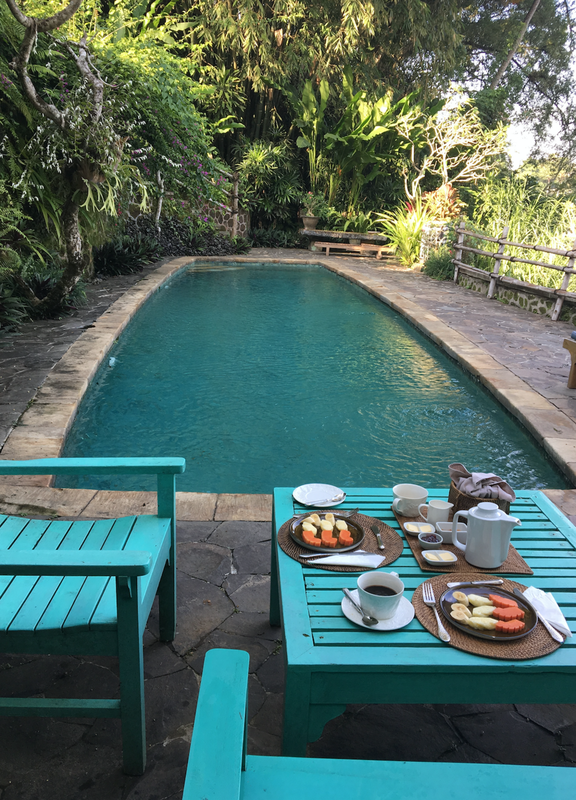 The next morning, we were served a breakfast, poolside, of phenomenal Balinese coffee and delicious fresh fruit, toast and eggs. Even though we only stayed one night, having our host's recommendations and driver contacts as we got our bearings was invaluable. 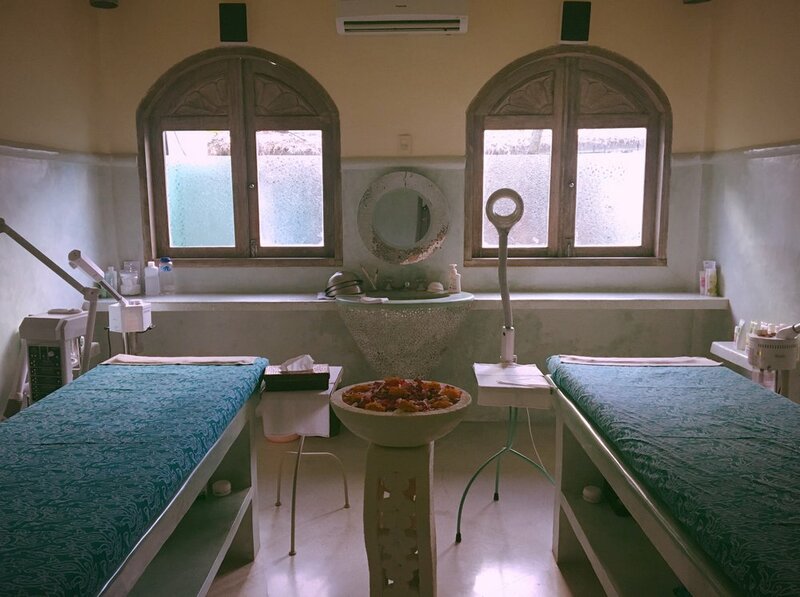 The centuries old technique of massage, which is inherent in Indonesian culture, promotes inner and outer health and beauty. Hinduism, which arrived in 400 A.D. introduced Ayuvedic medicine and the use of scented massage oils and medicinal plants. I am committed totally to the benefits of massage and was looking forward to booking as many treatments as possible. For this first one, I sought out the most beautiful yet affordable spa I could find. 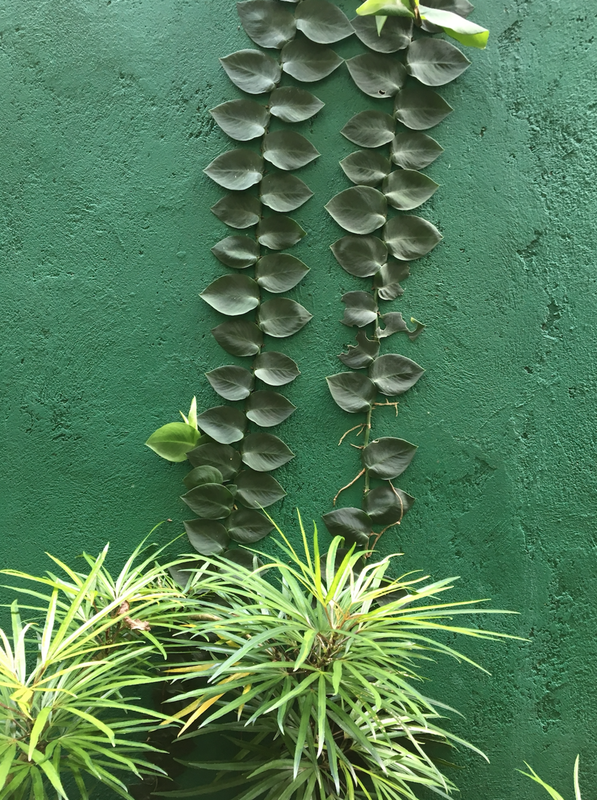 Located in Sanggingan, Bali Botanica is a short walk from the road, but feels a million miles away from the busy streets of Ubud. 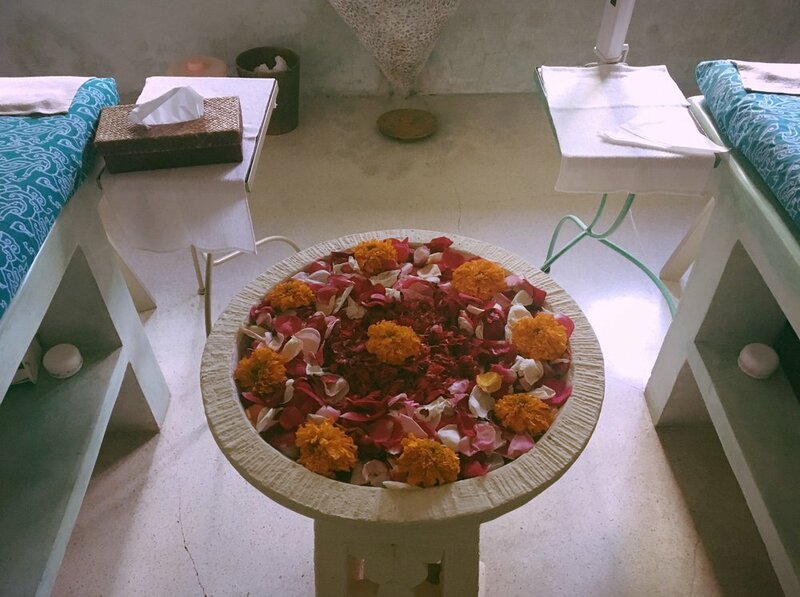 My friend and I both chose the ancient Javanese treatment, Mandi Lulur, which starts off with a 65 minute massage followed with an exfoliant (the classic "lulur", a combination of rice powder, turmeric, and sandalwood) and finishes with a gorgeous floral bath. 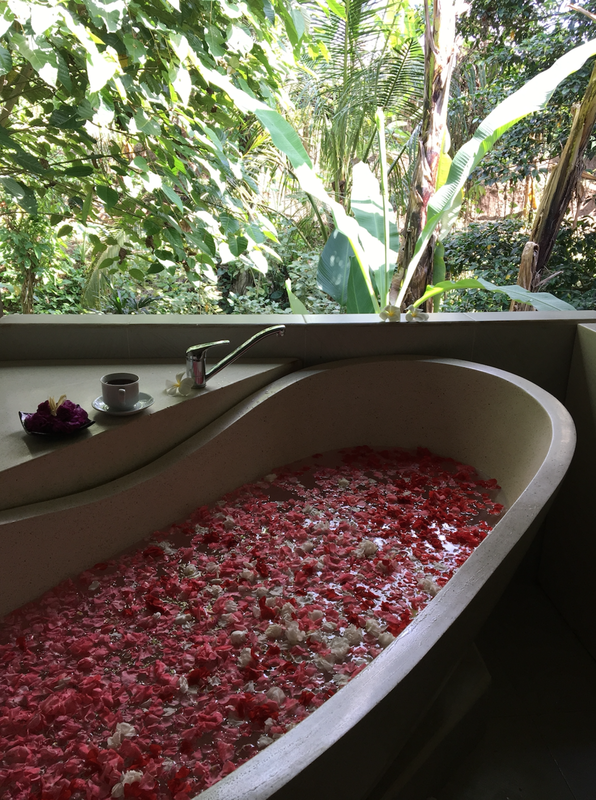 As you relax surrounded by fresh flower petals, you are kept company by the sounds of birds and wind in the palms of the jungle outside your window. Ubud is a very colorful and inspiring city. My favorite kind! The religious Balinese architecture felt very moody and wild, while the lush tropical greenery and flowers seemed to communicate that life in Bali is easy, beautiful and optimistic. At every doorstep, women are crafting offering baskets (I think called "canang sari") from palms or banana leaves and curating them with petals and gifts as blessings of thankfulness. The scented smoke of incense surrounds you and captures your imagination. I was most excited to see the fabrics of Bali. The traditional ikat fabric made from the technique of decoratively weaving tie dyed threads and batik, cloth decorated by a wax resist process. Below, is an example of silk batik scarves ~ and how difficult it was to choose! Jl. Raya Sanggingan Camuhan, Ubud - Bali. *The Chicken Satay Burger with peanut sauce was insane! 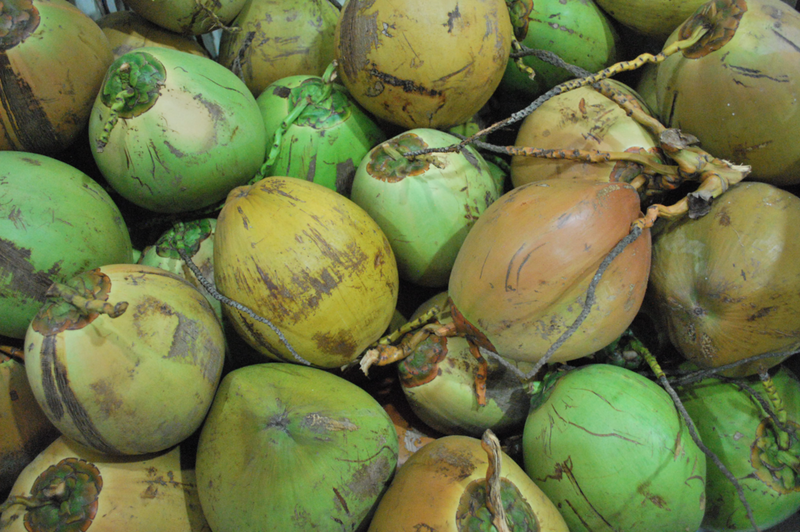 *Also check out the other culinary items made with coconut. 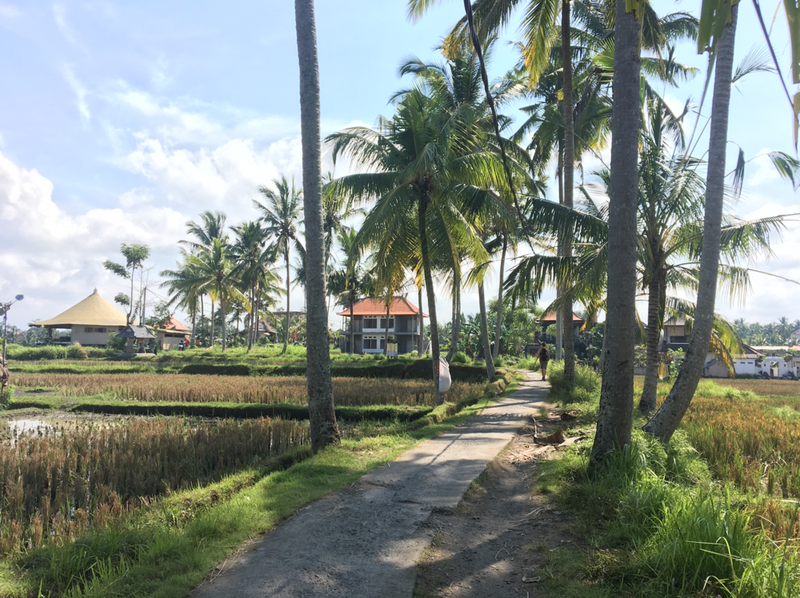 Ubud can be overwhelming. Take this walk just off the main drag to get some quiet and enjoy lunch or a drink overlooking the rice patties. 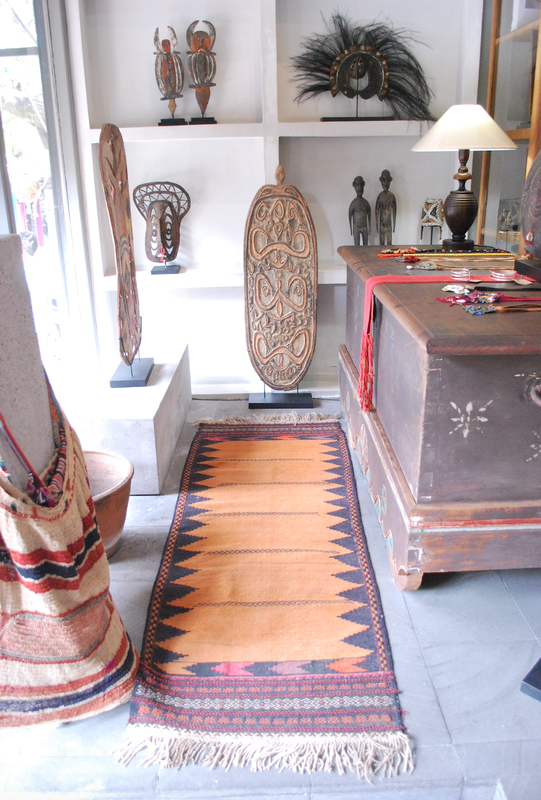 Starting at the Ubud Palace, walk west on Jl. Raya Ubud until you see the signs below (#1), take a right, and follow the road up a small steep hill. Stay to the right (#2) of the wall and follow the road north of town. 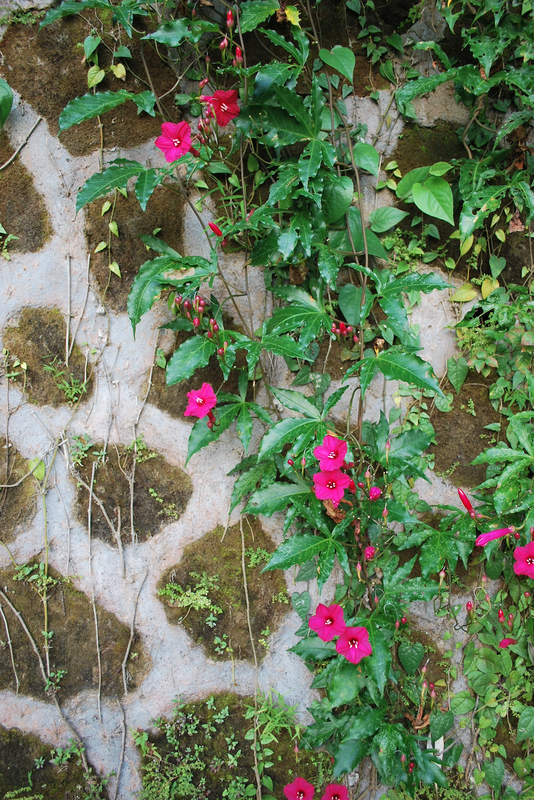 You will be following neighborhood pathways past the Ubud Yoga House to Café Pomegranate. Trust me this is a very special spot. 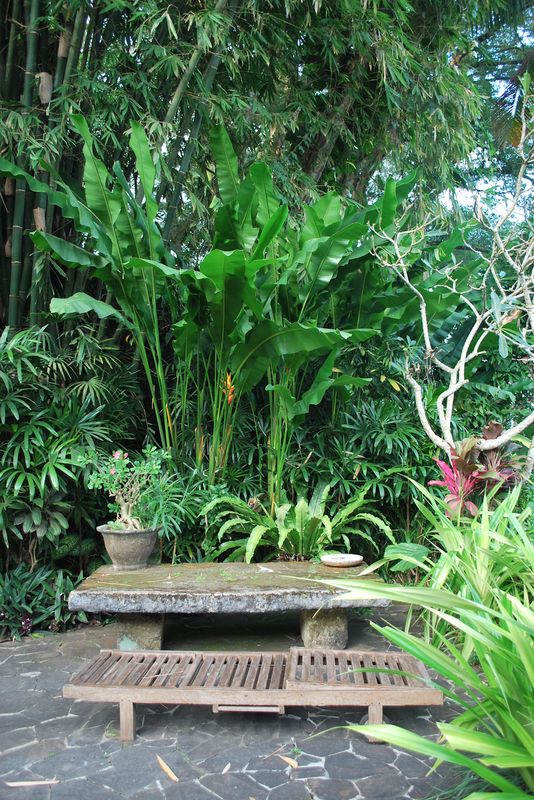 Tejaprana Resort & Spa was a tranquil hotel that gave us a quiet retreat from the busy streets of Ubud. From the moment we arrived, I was in awe of all the details. The impressive architecture and stunning landscaping featuring flowering vines and water lilies was breathtaking. Its hard to explain but somehow there was an magical iridescence to this place. Each room at Tejaprana comes with its own individual plunge pool. At the end of a long day of sightseeing and shopping, there is nothing better than a swim in your own private pool. Definitely order room service first thing in the morning and enjoy the sunrise. I naturally woke up at 6am each day and it was so deliciously indulgent to snuggle up in a robe on the day bed with a cup of coffee. I had read that Rocky Fast Cruises was the best ferry to Nusa Lembongan. (If their website isn't working try this.) They were very helpful, friendly and on time. They carry your bags onto the boat and help you to board. Seating on the boat isn't the most comfortable but not that different from school bus banquettes. Bring a book and it will go by fast! They also offer transfers to your hotel once you arrive on the island which made finding our way much easier. One afternoon, we decided to rent bikes and head to the north end of the island on the road to the Mangrove Forest. 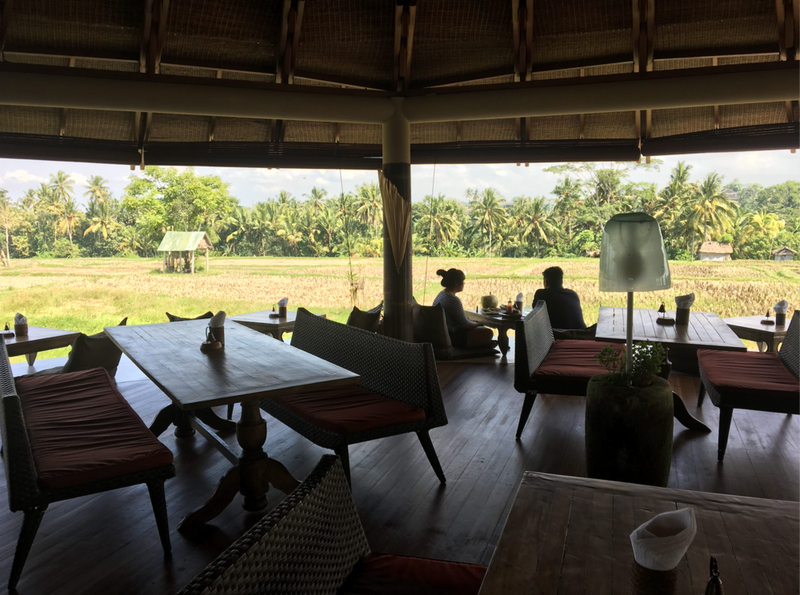 Almost all the way to the end, we found Warung Agung, a water side beach café --- with delicious satay! We pretty much had the place to ourselves and the vibe was spot on. It's kind of embarrassing, but I love piña coladas. I realize how cliché it is, but I can't help it! I tried ordering several while I was in Bali but the best one was at The Deck. This bougie albeit comfortable cliffside café and bar had the best views on the island. And... follow the gorgeous trail (see the pics below) to a small surfer's beach which felt like a secret spot. I am not going to lie, snorkeling with manta rays was terrifying for me. I'm definitely not a diver. I prefer snorkeling when there are small neon fish, dancing anemone and colorful coral (which thankfully I did get to enjoy later that day). Floating in the deep water watching mantas swim around and under me was pretty unbelievable. The experience made my heart beat so fast that I decided to head for the boat. Once I was up out of the water and -- "safe" -- I enjoyed watching the sun's reflection on the waves around us. This hotel is breathtakingly beautiful. We decided to book one of the eco-loft rooms which far exceeded my expectations as it was the "budget" choice. 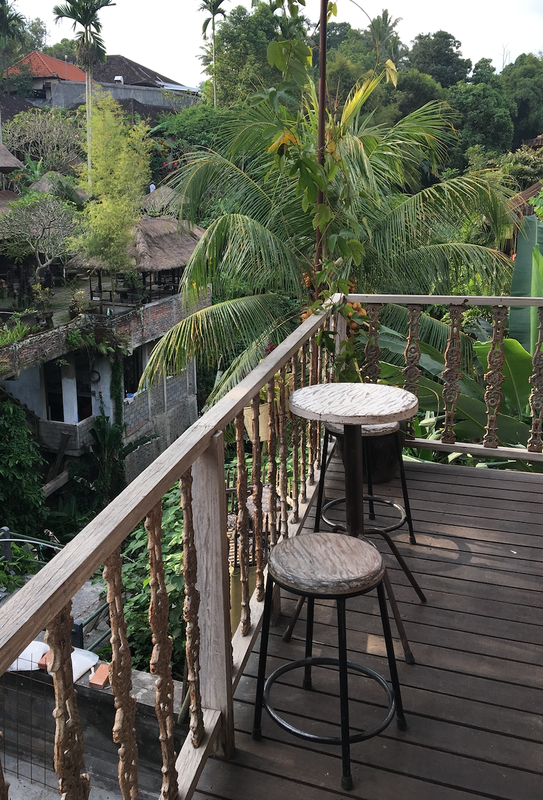 These garden-facing rooms are triangle-shaped, each a quarter of a larger, round, balinese hut and each have their own small private patio. The upstairs loft had a second bed which meant that my friend and I were able to spread out a little and enjoy some private space to ourselves. It turned out to be some of the best sleep of the entire trip. Breakfast was included, which we enjoyed each morning on the main patio outside the restaurant overlooking the Indian Ocean. Afterwards, we would spend most of the day by the pool, devouring books and banana smoothies. My second of three spa treatments in the trip was a Deep Tissue Massage at the La Joya hotel. Definitely ask for Sudi! She gave me the best massage of my life. Couldn't stop talking about it. La Joya has a private beach worth checking out below it's cliff. You can access it by a hidden set of stairs behind the pool. Be careful those waves are very forceful and can knock you over! 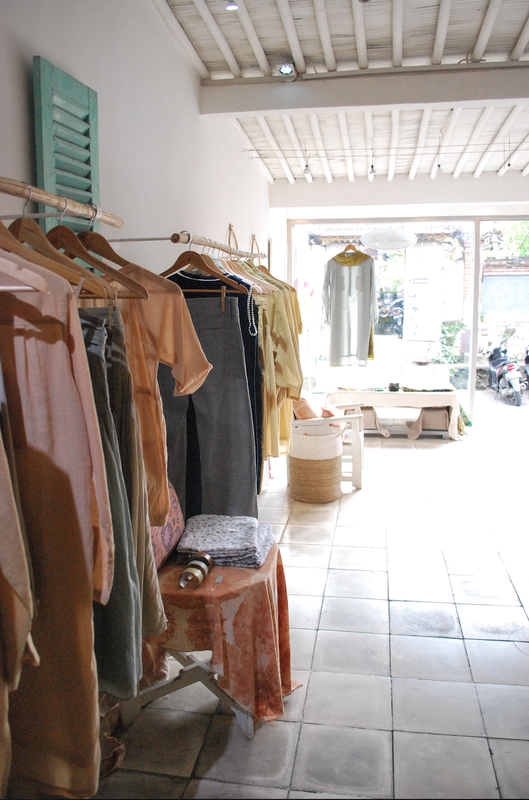 ++ Shops in Seminyak worth checking out! MAGALI PASCAL Effortless clothing with a french ethos. KARMA KOMA Bohemian clothing and accessories made from cotton and silk. LUCY'S BATIK Clothing and homewares made from batik fabric. GUARDIAN (drugstore) For inexpensive essential oils (rose, frangipani, jasmine, lavender), facial sheet masks. Want recs for your trip? I would be happy to help!